Many people are afraid to make any changes to anything to do with electricity around the home. They should be careful and if they do not know what they are doing, should really call an electrician in to make any changes or adjustments to wall switches, lights or electrical circuits. After all, making a mistake can be costly in terms of money as well as personal injury. At the same time calling an electrician to change a wall switch or to replace a ceiling fixture can also be very expensive. This is a pretty easy example of electrical work around the home. For them it is an easy job and takes 20 to 30 minutes to complete along with travel time. So it is profitable time spent for an electrician, and an expensive hour for the home owner. There are basic rules to follow when doing any kind of electrical work around the home. We will cover these rules in our post, however please call an electrician to do some of this work if you do not know what you are doing or are nervous about working with electricity. If you do not know what you’re doing, then hire an electrician. This is the most basic of rules and applies in every situation that you as a home owner will every be involved in. Always turn the power off your self and test the circuit to make sure it is not live before doing any work. 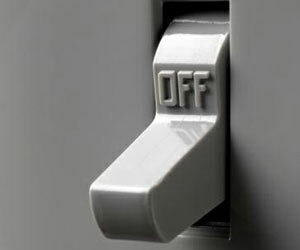 In my younger days, an older person was emphatic that he had turned the power off. Fortunately I had been trained to always test that the circuit is not live before doing any work, so I touch the bare wire against the back of a stove first and saw the sparks fly! Always do it your self! Pull the fuse, turn the circuit breaker off and make sure that there is no power on. I always turn on a light or some device on the circuit I am going to work on and them pull the fuse. When the light goes out, I know I have the right circuit and there is no power going to that switch or light that I am going to work on. Pretty simple, but it works and I avoid lots of other problems when I am doing electrical work around the home. Another tip if you are planning to do the work yourself is to always match up the colors. This means connect the white wire of the lamp with the white wire of the feed circuit, and the black with the black. Always attach the ground wire which is usually green to the metal box that you are attaching the lamp or the light switch to. If you match the colors you usually cannot go wrong, especially for the simple jobs. The circuit should always be grounded properly. If you do not know how to do it, then hire an electrician. Follow the rule above and connect the green wire to the metal housing of the box. When your home is wired by the builder, all electrical outlets are grounded. All Switches and lights and plugs have a ground wire which should be connected to this metal box to ensure that the lamp etc is also grounded. Once you have connected the wires either with a Mar connector or by attaching them using a metal screw to a connection post, give the wire a good tug to make sure that it is secure. If it is loose redo the connection to make sure that it is solid. Once all of the connections are made, turn the power on and make sure that it works as planned. If it does not operate properly, turn the power off and re-check the connections including the light bulb if you are connecting a lamp of some sort. Even if you are confident that the power is turned off, it is always a good idea to get into the habit of not touching the bare wires. Secondly if you have to touch a bare wire, never touch both bare wires at the same time and do not ground yourself in some manner. With the power turned off, you should not have to worry, but some day you might just make a mistake and leave the power on. Following this rule will give you another level of protection! After all of this, if you feel uncomfortable, spend the money and hire a certified electrician to have the job done right. Your house will be safe, you will be safe and there will be no doubt about any accidents or accidental fires from bad connections. Electricians may cost as much as $100 an hour, but when you consider the alternative, the money is nothing compared to a burn or electrocution. We invite comments from readers and suggestions on our blog. Feel free to make comments, however spam comments will be deleted. Also negative comments or obnoxious comments will also be deleted. Enjoy our blog and look for more to be added every few weeks. Well, as someone who’s always doing a project… I appreciate your blog. Like to learn everything I can.